Your support has been strong for the first two weeks of Gypsy Gift Voting! Please keep up the daily voting and sharing LexLin Gypsy Ranch facebook posts in support of your favorite PATH premiere accredited Equine Assisted Activities and Therapies center! Thanks so much for supporting LexLin Gypsy Ranch’s 2nd annual Gypsy Gift Program. We are donating 10 Gypsy Horses to the top 10 centers this year. We’re very excited to be able to give a Gift that will keep on giving in the years to come through your programs that touch many lives! 1. 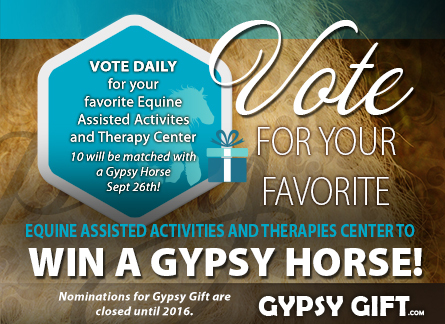 Get your center staff, supporters, family, friends and friends of friends to vote daily for your center via the Gypsy Gift 2015 link below the timeline photo on the LexLin Gypsy Ranch facebook page https://www.facebook.com/GypsyVannerHorsesForSale or access the Gypsy Gift voting page via http://gypsygift.pgtb.me/jsGLMS Voters may submit 1 vote every 24 hour hours through 12 pm EST on August 31, 2015. If neither of those methods work for voting please try http://gypsygift.pgtb.me/XZCWsm. 3. All motivation quotes posted through August 31, 2015 will include links to the Gypsy Gift voting page. 4. Start a facebook group (or post directly on your page) any status updates on your position in the voting, share facts about Gypsy Horses, and any other posts you may think of to encourage/remind your supporters to keep voting daily for you center. 5. Alert local media – tv, radio, newspapers, etc. so they can feature your center in a story/broadcast to help raise more support for your center through votes from those who learn about the program through the media and want to help your center by placing daily votes. 6. Send promotional highlights, history and or other interesting material for your center to myself via design@equineoriginals.com. I will try to highlight centers from time to time throughout the voting period on LexLin’s facebook page. We have 89k + facebook likes and would be happy to highlight your center to raise awareness and suppport of your center and the Gypsy Gift program. 7. Get creative on your facebook pages and within your newsletters, etc. Challenge your supporters to help you raise a certain number of votes with a specific time period and pick a random supporter to give a prize to, celebrate with a bbq, have a grooming day, etc. Anything that will help keep your supporters voting and excited to help you in this quest for a Gypsy Horse for your center. 8. Feel free to run with any other ideas you may have to further your center’s support in Gypsy Gift 2015. We would like to invite you all to our 7th Annual Gypsy Vanner Open house at LexLin Gypsy Ranch in Rockwood, TN on September 26, 2015. We would be delighted to have you attend even if your center is not one of the final 10 centers to win a Gypsy Horse this year. The top 10 centers will be presented with their Gypsy horses at the Passing of the Lead ceremony during our open house. Visit http://www.gogypsy.com/openhouse2015/ to RSVP today. We are getting updated photos & videos of the 10 Gypsy Gift horses and will be announcing them later this week. Thanks for making Gypsy Gift 2015 a spectacular program!